Introduction: One third of individuals with chronic obstructive pulmonary disease (COPD) report pain. To help inform a COPD-specific pain intervention, we explored the views of health care providers (HCPs) and individuals with COPD on pain during pulmonary rehabilitation (PR). Methods: This is a qualitative study using inductive thematic analysis. Eighteen HCPs familiar with PR and 19 patients enrolled in PR participated in semi-structured interviews. Demographic data were recorded, and the patients completed the Brief Pain Inventory (Short Form). Results: 1) Interaction between pain and COPD: pain is a common experience in COPD, heightened by breathlessness and anxiety. 2) Pain interfering with PR: a) Communicating pain: HCPs rarely ask about pain and patients are reluctant to report it for fear of being removed from PR. b) PR is a short-term aggravator but long-term reliever: although pain limits exercise, concentration, and program adherence, PR may reduce pain by increasing muscle strength and improving coping. c) Advice and strategies for pain: some attention is given to pain management but this is often counterproductive, encouraging patients to cease exercise. 3) An intervention to manage pain: HCPs were enthusiastic about delivering a pain intervention within their knowledge and time constraints. Early group education was preferred. Conclusion: A pain intervention seems warranted in PR and may improve adherence and therefore clinical benefit. A pain intervention could be provided as part of PR education with HCP training. Considering the adverse influence of pain in COPD, a pain intervention has the potential to improve function. To develop such an intervention, it is important to understand the views of health care providers (HCPs) and individuals with COPD on pain within the context of PR. The aims of this study were twofold: 1) to explore the views of HCPs, responsible for delivering PR, on pain in individuals with COPD and 2) to understand the opinions of patients enrolled in PR on the impact and influence of pain and to explore whether they feel their pain needs are currently being met. A collaborative, international, qualitative study design was conducted between the UK and Canada. Ethical approval was obtained from Teesside University research ethics committee, the NHS research ethics committee, South Tees Hospital NHS Foundation Trust Research and Development, and The Joint Bridgepoint Health – West Park Healthcare Centre – Toronto Central Community Care Access Centre – Toronto Grace Health Centre Research Ethics Board. All participants provided informed consent. Recruitment took place at PR programs within the South Tees Hospitals NHS Foundation Trust, UK, and at West Park Healthcare Centre, Ontario, Canada. Convenience sampling was used to target HCPs responsible for delivering PR and individuals with COPD enrolled in PR programs. Individuals with COPD who reported experiencing pain were considered eligible. Individuals were excluded if they had a respiratory diagnosis other than COPD; did not report pain; or were unable to communicate because of language skills, hearing, or cognitive impairment. 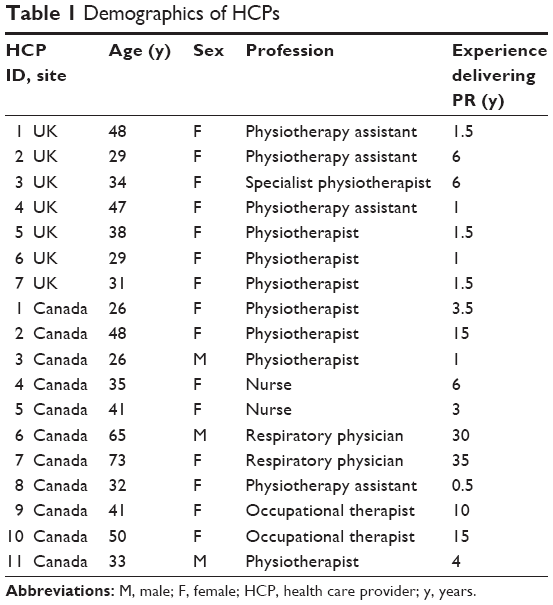 Eighteen HCPs completed an interview (seven UK and 11 Canada) and 19 patients (nine UK and 10 Canada) (Figure 1). Recruitment was considered to be complete once data saturation was reached. This occurred following 15 interviews with HCPs and 18 interviews with individuals with COPD and was confirmed in a further three interviews with HCPs and one interview with a patient. Figure 1 Recruitment flow diagram. Abbreviations: COPD, chronic obstructive pulmonary disease; HCP, health care provider. The interviews were audio recorded and transcribed verbatim by a professional transcriber. The data were stored and organized using a computer software program (QSR NVivo version 10; QSR International, Doncaster, Australia) and analyzed using inductive thematic analysis (ITA) following the procedure described by Hayes.12 SH completed the initial coding, which involved grouping units of text into categories and provisionally labeling them. Two researchers (SH and HE) completed this step independently for two transcripts, agreeing the categories before SH coded the remaining transcripts. SH and HE reviewed the original transcripts and ensured that the labels and descriptions assigned to each code were accurately supported by the data. Categories were then grouped into emerging themes agreed on by the two researchers. Each data set (HCPs and individuals with COPD) was analyzed separately and presented to other members of the research team (AL, CR, and DM). During this team meeting, relationships were discussed between the themes and the findings from the two data sets were combined. 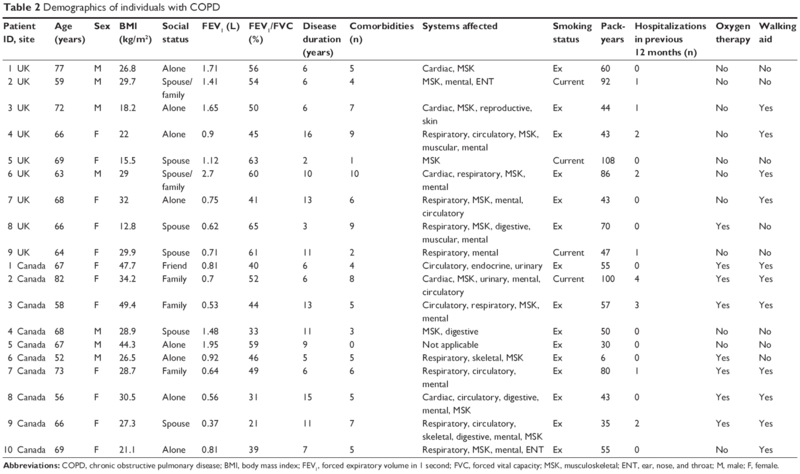 Demographic data of HCPs and individuals with COPD are shown in Tables 1 and 2, respectively. 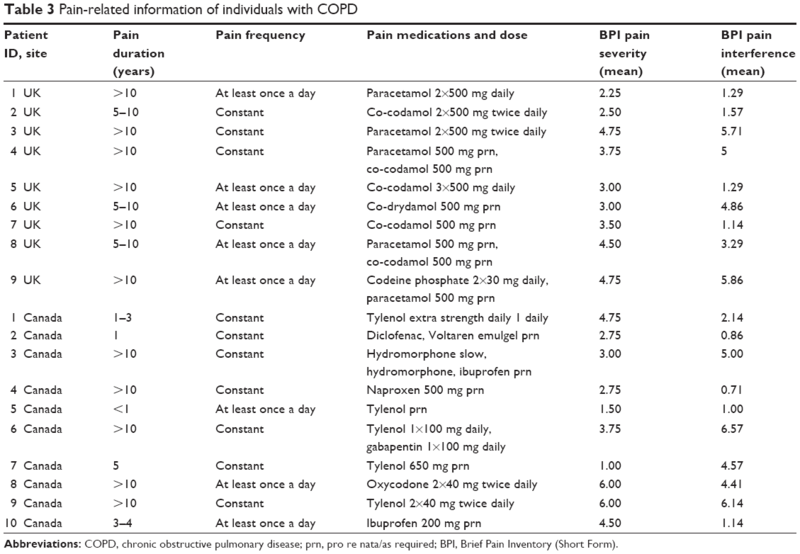 Pain-related information of individuals with COPD, including results from the BPI, is given in Table 3. Abbreviations: M, male; F, female; HCP, health care provider; y, years. Abbreviations: COPD, chronic obstructive pulmonary disease; BMI, body mass index; FEV1, forced expiratory volume in 1 second; FVC, forced vital capacity; MSK, musculoskeletal; ENT, ear, nose, and throat; M, male; F, female. Abbreviations: COPD, chronic obstructive pulmonary disease; prn, pro re nata/as required; BPI, Brief Pain Inventory (Short Form). Three overarching themes were identified from the data: 1) interaction between pain and COPD, 2) pain interfering with PR, and 3) an intervention to manage pain. Nine individuals with COPD also highlighted other benefits of PR, not related to pain. These benefits of PR are well described in the qualitative literature13 and the prevalence and impact of pain has also been documented.1 Therefore, these findings were largely bracketed although they provide context for the individuals’ views. Some patients were unclear whether their pain was a consequence of COPD or an independent comorbidity. Not knowing made patients question the legitimacy of pain wondering if it is “all in my head” [Patient 3 Canada]. For these patients, pain was a necessary part of PR, facilitating recovery and improvement. In instances where severe pain prevents participation, HCPs report referring patients back to their general practitioner (GP)/family doctor, cementing patients’ concerns about communicating pain, especially if they have already spoken to their GP and found them to be unhelpful in addressing pain. Current advice in PR to manage pain is limited to heat therapy, transcutaneous electric nerve stimulation, prescription of an assistive walking device, and recommendations to take medications before exercise. Patients’ report their own strategies for managing/relieving pain including: bath/shower, rubbing volterol (anti-inflammatory gel) into the affected area, medication, distraction (knitting), relaxation, heat packs and repositioning. It is not clear how these techniques evolved, but it seems to be through the process of trial and error. I think yeah at the beginning would be probably be the best. [HCP 9 Canada]. This is the first qualitative study exploring the role of pain in PR from the perspectives of HCPs and individuals with COPD. The focus of PR on predominantly addressing symptoms of dyspnea deters a broader enquiry of pain. This plus patients’ fear that pain might render them ineligible for PR results in patients being reluctant to communicate pain at least until later in the program when they have developed a rapport with HCPs. When exercise aggravates musculoskeletal pain, HCPs will modify and limit exercise. In the upper body and thorax, pain may be aggravated by the increased efforts of breathing as well as local muscle tension, in which case attention to both functional and emotional activities contributing to increased ventilation may be valuable. A COPD-specific pain intervention could be delivered as part of the group education sessions during PR, although specific pain management training for HCPs, as well as additional time, would be required. Notwithstanding the comorbidities of osteoporosis and osteoarthritis, both of which are increased in COPD,7 most patients reported thoracic pain, in keeping with previous reports of the prevalence of thoracic pain between 36% and 54% in patients with COPD enrolled in PR.2,14 Thoracic pain is much less common in the non-COPD population.15 In one study although thoracic pain was associated with worse quality of life, no difference in airflow limitation, lung hyperinflation, or diffusing capacity was observed among COPD patients with or without pain.14 A pain intervention that highlights the interactive relationship between experiences of pain, dyspnea, and anxiety will help patients rationalize how these symptoms interact in COPD.16,17 It will also likely reduce non-completion of PR,5 which is seen as aggravating pain in the short term. There are a number of study limitations to note. The HCPs and patients agreeing to the study were more likely to be interested in the symptoms of pain and more enthusiastic about a pain intervention. The two interviewers had different clinical backgrounds, although the inclusion of participants from two different countries strengthens the authenticity of the findings. This study has focused on the non-pharmacological issues, but clearly any non-pharmacological intervention should be balanced with the necessary analgesics and anti-inflammatories. The transcripts were not reviewed to verify accuracy, but the moderate sample size and the inclusion of five researchers (two with experience in PR [SH and AL], one with a psychological background [HE], and two with expertise in pain [CR and DM]) in the analysis enhances rigor. The impact of pain among patients with COPD enrolled in PR is both unrecognized and unreported. The specific effect of PR on pain has not been formally studied although there is optimism that a combination of improved physical function and improved symptoms of dyspnea, anxiety, emotional function, and mastery will complement a pain intervention. A specific pain intervention would be welcomed by both HCPs and patients. The content of such an intervention should be informed by the views of HCPs and patients on the role of pain in PR. A pain intervention could be provided early in the PR program by HCPs provided that they received additional training in this area. Such an intervention could be in conjunction with other pain management strategies that link pain and breathlessness. A group setting is preferred for delivery with the option for one-on-one support as necessary. This research was funded by Teesside University Research Funds (grant number 15/10/04). DB holds a Canadian research chair from Canada Research Chairs Program. Lee AL, Harrison SL, Goldstein RS, Brooks D. Pain and its clinical associations in individuals with COPD: a systematic review. Chest. 2015;147:1246–1258. Bentsen SB, Rustoen T, Miaskowski C. Prevalence and characteristics of pain in patients with chronic obstructive pulmonary disease compared to the Norwegian general population. J Pain. 2011;12:539–545. Bentsen SB, Rustøen T, Miaskowski C. Differences in subjective and objective respiratory parameters in patients with chronic obstructive pulmonary disease with and without pain. Int J Chron Obstruct Pulmon Dis. 2012;7:137–143. Spruit MA, Singh SJ, Garvey C, et al. An official American Thoracic Society/European Respiratory Society statement: key concepts and advances in pulmonary rehabilitation. Am J Respir Crit Care Med. 2013;188:13–64. Keating A, Lee A, Holland AE. What prevents people with chronic obstructive pulmonary disease from attending pulmonary rehabilitation? A systematic review. Chron Respir Dis. 2011;8:89–99. Borge CR, Wahl AK, Moum T. Association of breathlessness with multiple symptoms in chronic obstructive pulmonary disease. J Adv Nurs. 2010;66:2688–2700. Franssen FME, Rochester CL. 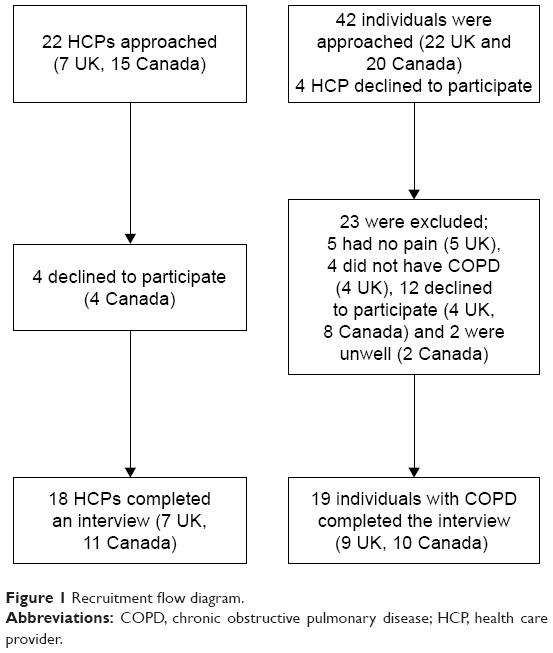 Comorbidities in patients with COPD and pulmonary rehabilitation: do they matter? Eur Respir Rev. 2014;23:131. HajGhanbari B, Holsti L, Road JD, Darlene Reid W. Pain in people with chronic obstructive pulmonary disease (COPD). Respir Med. 2012;106:998–1005. Lee AL, Harrison SL, Goldstein RS, Brooks D. An exploration of pain experiences and their meaning in people with chronic obstructive pulmonary disease (COPD). Physiother Theory Pract. In press 2017. Keller S, Bann CM, Dodd SL, Schein J, Mendoza TR, Cleeland CS. Validity of the brief pain inventory for use in documenting the outcomes of patients with noncancer pain. Clin J Pain. 2004;20:309–318. Reid WD, Chen Y-W, HajGhanbari B, Coxson H. Validation of the brief pain inventory in people with chronic obstructive pulmonary disease. Eur Respir J. 2016;48(Suppl 60):PA3735. Hayes N. Doing Psychological Research. Buckingham, PA: Open University Press; 2000. Williams V, Bruton A, Ellis-Hill C, McPherson K. The effect of pulmonary rehabilitation on perceptions of breathlessness and activity in COPD patients: a qualitative study. Primary Care Respir J. 2010;19:45–51. Janssen DJA, Wouters EFM, Parra YL, Stakenborg K, Franssen FME. Prevalence of thoracic pain in patients with chronic obstructive pulmonary disease and relationship with patient characteristics: a cross-sectional observational study. BMC Pulmon Med. 2016;16:47. Briggs AM, Smith AJ, Straker LM, Bragge P. Thoracic spine pain in the general population: prevalence, incidence and associated factors in children, adolescents and adults. A systematic review. BMC Musculoskel Disord. 2009;10:77. Clarke A, Anthony G, Gray D, et al. “I feel so stupid because I can’t give a proper answer…” How older adults describe chronic pain: a qualitative study. BMC Geriatr. 2012;12:78. Geneen LJ, Martin DJ, Adams N, et al. Effects of education to facilitate knowledge about chronic pain for adults: a systematic review with meta-analysis. Syst Rev. 2015;4:132. Robinson V, King R, Ryan CG, Martin DJ. A qualitative exploration of people’s experiences of pain neurophysiological education for chronic pain: the importance of relevance for the individual. Man Ther. 2016;22:56–61. Leeuw M, Goossens ME, Linton SJ, Crombez G, Boersma K, Vlaeyen JW. The fear-avoidance model of musculoskeletal pain: current state of scientific evidence. J Behav Med. 2007;30:77–94. Do you believe pain to be a common symptom in individuals with COPD? What do you know about pain in individuals with COPD? If yes, how do you think it affects them? Locations? Severity? A recent systematic review suggests that approximately 66% of individuals with COPD have pain. Does this surprise you? Why? Why do you think patients with COPD have pain? Do you think it is associated with their breathlessness? Do you think participating in PR makes patients pain better or worse? Why? Do you think pain affects patient’s ability to participate fully in PR? How? Please could you provide some examples? Do you ask patients about their pain during their initial assessment for PR or during the program? How important do you think it is that HCPs ask about pain? Why? Have any patients approached you to talk about their pain? How did you respond? Did you feel able to deal with their issues? What would have made you feel more able to offer advice/treatment? Other than the exercises, do you think pain affects any other aspects of PR? How? Education/concentration? Mood/less sociable? Can you describe any strategies or techniques which might help patients manage their pain whilst in PR? Education? Talking to a HCP? Specific exercises? Peer support? If we were to develop a pain intervention which may consist of some education and specific exercises is this something you would be interested in delivering to individuals with COPD? If not, why not? If yes, what additional training/support would you need, if any? Do you think a pain intervention could be delivered within PR or should it be delivered before or after PR? Why? Should a pain intervention be delivered in a group or in one-on-one sessions? Why? I have asked the questions I have, is there anything you would like to add about pain that we haven’t discussed? You said that you experience pain which is why you have been invited to take part in this interview, can you please begin by describing your pain? What makes it worse? What makes it better? Is it constant or does it fluctuate? Does it come on gradually or all of a sudden? Where is your pain? How does it affect you? Do you think pain is associated with your breathing problems or is it something separate? Why? Does it get worse when you get breathless? Or does your breathlessness get worse when you are in pain? Does pain affect your ability to be active and exercise? How? If not, why, how do you overcome this? Describe? Do you think participating in PR makes your pain better or worse? Why? Do you think your pain affects your ability to participate fully in PR? How? Please could you provide some examples? Does pain affect your ability to exercise at home? Has anyone in the PR program asked you about your pain? How important do you think it is for healthcare professionals to ask about your pain when you are entering this kind of program? Why? Have you talked to anyone in PR about your pain? If not, why not? Health care professional and peers? How did they respond? How did that make you feel? Other than the exercises, does pain affect any other aspect of PR? How? Education/concentration? Mood/less sociable? Can you describe any strategies or techniques you use to try to manage your pain whilst in PR? How effective are they? What do you think might help you manage your pain in PR? Education? Talking to a HCP? Specific exercises? Peer support? If we were to develop a pain intervention which may consist of some education and specific exercises is that something you would be interested in participating in? If not, why not? If yes, what would you expect from the intervention? How do you think it would help you? Should an intervention of this kind be delivered within PR, before or afterwards? Why? Who do you think should deliver this kind of interventions? Should it be someone in the PR team or someone separate?